I’m happy to announce the immediate availability of the Final Rush Pro 5 map for Supreme Commander Forged Alliance Forever. During the past few weeks I’ve been reworking version 4 of the map, and have added many new features, fixed some bugs and improved balance in the team vs team modes. Version 4 has a Game Mode setting with Paragon Wars, Survival Versus, Normal and 4 different difficulties of Survival Classic. Version 5 has a dedicated Survival Difficulty setting, so it’s not possible to change the difficulty for Survival Versus. Furthermore, a ton of new lobby options have been added that allow changing the delay of the various tech level waves, their frequency, how quickly the units should gain health, how often random events should happen, etc. This gives you much greater control over the difficulty in all survival modes, and adds a lot of replayability by enabling alteration of the nature of the challenge the map provides. The team vs team modes, Survival Versus and Paragon Wars, both had some serious balance issues. In Survival Versus, random events and bounty hunters would attack a random player. While that works fine in Survival Classic, in the modes with two teams, it makes things unfairly harder for a single team. I’ve observed this several times, where suddenly one team gets whacked by a few random events even though they where doing better than the other team. In this new version, random events and bounty hunters target a random player from each team. In Paragon Wars, the issue was that the civilian base protecting the Paragon Activator would be randomly constructed. Within a certain bounding box, the Paragon Activator and a bunch of defensive structures would spawn. This means the Activator could be at the far side of the bounding box, and the defenses mostly on the other side, making it a lot easier for one team to approach the Activator than for the other. Now the base is entirely symmetrical (using a circular layout) and spawns at the exact center of the map. Version 4 had 6 working lobby options, while version 5 has 23. Besides the new difficulty related options, it is now possible to turn off aspects of the game. For instance, you can now completely disable random events, MMLs and “aggression tracking” (punishing of fast tech, high eco and aggressive ACU placement). Some significant bugs were fixed, most notably Paragon Wars not working correctly when playing with less than 8 people. You can now play it 2v2, 4v1 or however else you see fit. Another thing that was fixed is the Auto Reclaim option, so there is no more need for the Vampire mod. Unlike the mod, this option allows you to specify how much resources you should get, all the way from none, to over 9000% (that is an actual value you can select yes). Another mod that is no longer needed is the FinalRushPro3 itself. You now just need the map, and it will function properly without any mods. Due to removing integration with the FinalRushPro3 mod, the special UI is no longer present. In a lot of cases it did not work properly anyway and just took up space, and I’ve not gotten around to making a better replacement yet. You can download the map as a zip. Unfortunately the FAF map vault infrastructure is rather broken, so I’ve not been able to upload the map to the vault. Hopefully this gets resolved soon. For a full list of changes, see the readme. I got a number of ideas for future enhancements, which might become part of a version 5.1, 5.2, etc. Feel free to submit your own feature requests! 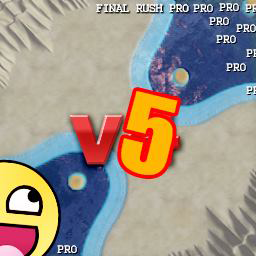 If you’re interested in how I went about creating version 5 from a technical point of view, see my post on Refactoring horrible Lua code.